Should I Repair Or Replace My Sub-Zero Appliances? Sub-Zero appliances are some of the most essential tools of your home. They keep your food at the proper temperature, your beverages chilled, and ice aplenty! Refrigerators and other sub-zero appliances are especially important when you live in warm climates like Dallas, Plano and other Texas cities. When the heat is scorching you need reliable appliances to depend on. But what should you do if your appliance does begin to have issues? Should you repair or replace? Although having a shiny new appliance is exciting, it can also be a financial inconvenience. Here are some of the reasons why you should consider repairing your sub-zero appliances versus replacing in the Dallas area! This doesn’t help us, but appliances are statistically breaking down and having issues at some of the lowest rates in history. The do actually make them like they used to! 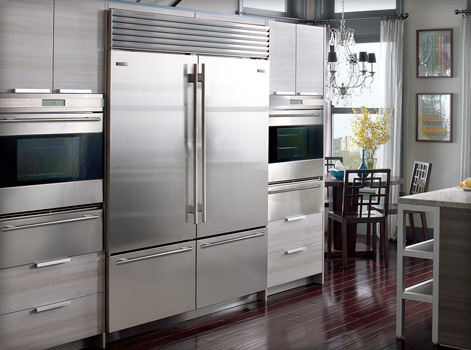 Sub-zero appliances and refrigerators are lasting longer than ever. So why would you spend the money to replace an entire appliance when you can affordably fix a small issue and keep your appliance running for years to come! This will enable you to save more money for other needs in the home, while having dependable products for your family. Families cannot afford to replace large appliances regularly, nor should they have to! Large appliances cost large sums of money and it can be extremely smart to repair instead of replacing in these situations. Repairs can cost a drop in the bucket compared to purchasing large, high-end sub-zero appliances that can cost thousands to replace. If your appliance is covered by a warranty, many manufacturers have trusted third party technicians that can come to your home, evaluate and determine if your product’s issue falls into your warranty. If this is the case, the technician can fix the issue at no cost or a reduced cost to you the consumer. Be sure to ask your manufacturer if you can choose a local, certified company that can complete repairs in home, like On-Time Appliance! Every time your repair instead of replacing an appliance, you are keeping one less appliance out of a dumpster, landfill and not hurting the environment. Help keep Texas clean! Having issues with your sub-zero appliances? On-Time Appliance can service your appliances in your home in the Dallas, Richardson, Plano, Murphy, Allen and Sachie Texas areas. Learn more today!